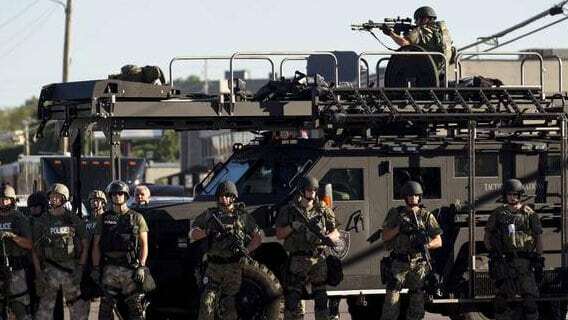 Equipped with fatigues, assault weapons and armored vehicles, the police response in Ferguson, Missouri was proof that America is quickly becoming a militarized police state. Disclaimer: This is not a blog post meant to take a side in whether Michael Brown was murdered by Police or the actions of Michael Brown legitimized the shots that fatally killed him. 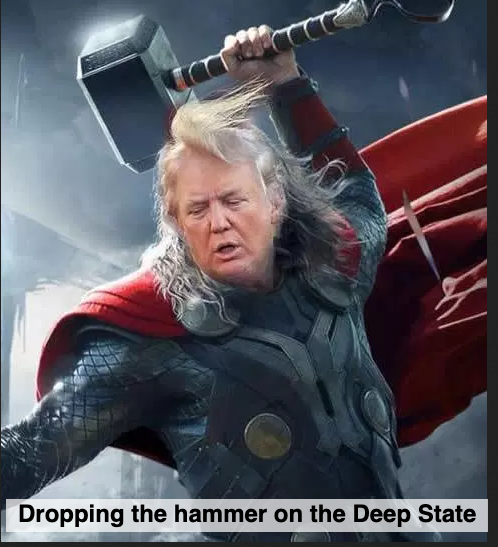 It is rather another post about the ever increasing Police State in America and how quickly peace can turn to Martial Law. - W.E. The shooting and killing of 18 year-old Michael Brown by a police officer sparked outrage in Ferguson, Missouri – a city that is predominantly Black but where the police force is overwhelmingly White. According to eye witnesses, the young man was shot about eight times, even though he was unarmed and had his hands in the air. Ferguson police officials stated that Brown was attempting to take a police officer’s weapon – a version of the story that was contradicted by various eye witness accounts. The death of the young man at the hand of police caused protests which degenerated into looting and rioting. Far from attempting to calm the situation, local authorities turned Ferguson into an occupied war zone as police showcased its vast array of military equipment. Ferguson, an inner-suburb of the Midwest suddenly occupied by soldiers equipped with military fatigues, kevlar vests, helmets, tear gas and assault weapons, followed by armored vehicles topped by snipers. Some war veterans even noticed that “police officers” were better equipped than they were while serving in Iraq. This kind of upsetting scene is becoming increasingly common in America as police forces across the country have been actively purchasing military equipment in the past few years. Ferguson police also a tactic that is seen in Gaza-like war zones when they actively targeted journalists and anyone filming policemen at work. Others in the streets were tear-gassed and hit by rubber bullets as police met the protesters, outfitted in SWAT gear and accompanied by snipers on armored vehicles. 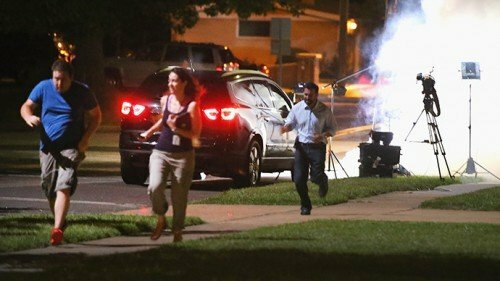 Nor were they they the only journalists targeted: here you can see footage of an Al Jazeera America crew fleeing their video equipment after getting hit with tear gas, after which a SWAT vehicle pulls up and police take down the camera and lights. A SWAT team. To take out cameras. In the United States of America. Because you know how dangerous it is when people start pointing those things around. TV crew fleeing after receiving tear gas near its equipment. Events in Ferguson prove that America is turning into a militarized police state and that it doesn’t take much to point military gear on American citizens.